Time Is Running Out … Lots Are Filling Up! This Is Your Last Chance to Own a Beautiful, Affordable, Brand New Home Here at Cypress Lakes 55+ Community! 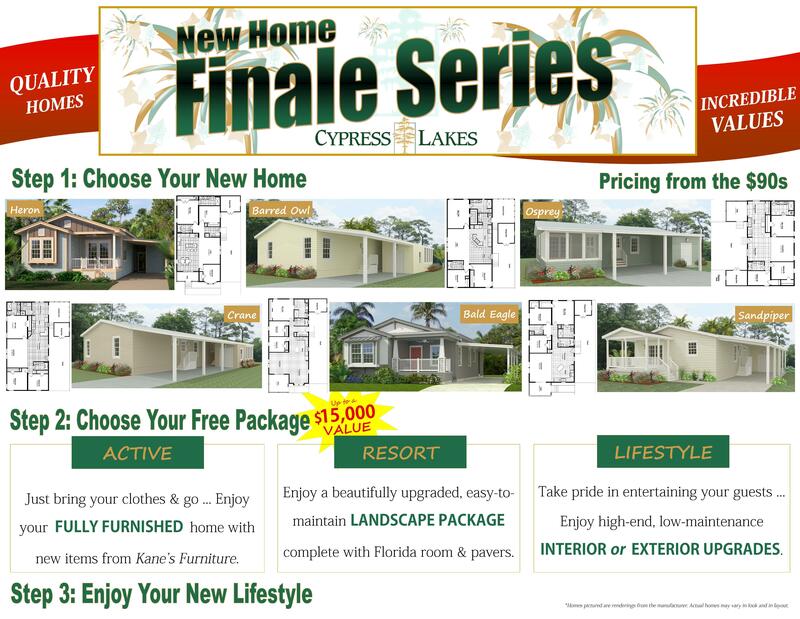 In our final development stage, Cypress Lakes 55+ Community has partnered with select, reputable manufactured home builders to offer six exclusive floorplans that are fully customizable and exceptionally affordable! We have several Finale Series models ready and available to you today! Or, choose from the select number of vacant lots left where you can build your very own model home. Choose your home, choose your free upgrade package—valued at up to $15,000—and you’ll be set to enjoy your affordable resort lifestyle for years to come!